In a month from now, I will be visiting researcher at the Metropolitan Museum of Art in New York for a full year, assisting the Arms and Armor Department with its vast collection of Japanese swords, fittings, and armor in terms of reorientation and future rotations of the items on display, although I can’t give any concrete info at this point in time. But I will keep you all updated. I am greatly honored by having this tremendous study opportunity and as this will be a full-time job, it comes with some changes of course. First, things that remain unchanged. I will still accept translation inquiries in terms of certificates and texts as long as they are “straightforward,” that is, follow-up research and info will be very much limited. Also ongoing translations with the societies like NBTHK/AB-EB and JAS will continue without any change. Ongoing (book) projects will continue as well and will be finished accordingly and also articles will be published on my site on a regular basis. As the decision was made relatively late, I am still looking for a decent place to rent in NY for that year. So if any of my local friends has any tips in that regard, it would be very much appreciated! That said, follow me here, via @swordtranslator on instagram or via facebook for updates and reports from the museum. Thank you all and a special thanks to all those who put in a good word for with the museum! Usually when it comes to details in a swordsmith’s career, we are dependent on written records which were either compiled by period sword scholars, by fief/government officials, or by the family/lineage of the swordsmith. As you can imagine, things get lost over the centuries and you can basically say what you like on paper. That is, on certain occasions, either the local administration or the bakufu required the craftsmen that it employed to provide them with a genealogy or a family history, for example in order to assess an employment status or a rank. Now when you are the head of a family of swordsmiths or tsuba makers and approached with this official task, you present your lineage of course from its best side. So far, so good, but then there are works by artists extant on/via which they explicitly state that on this or that day a certain thing happened and that this thing was a game changer. In many cases, the discovery of such a work nixes written records, or at least sets them straight, e.g. a smith mentioning in the mei that he made a blade in year X and at the age of Y on the basis of which his year of birth can be calculated, not seldomly contradicing the year of birth that one of his descendants later wrote down for the bakufu. Or, scholars were just assuming when certain things happened until that one work popped up. The sword that I want to introduce here is auch a work. Now we are talking about the Harima-based smith Sōei (宗栄), or to be precise, about the third generation of that lineage. To get that out of the way, his name is sometimes also read Munehide and that might have actually been the proper reading of his name as the Sōei lineage goes back to a group of smiths who shared the Mune (宗) character and who read it that way, i.e. Munenaga (宗長), Munetsugu (宗次), Muneshige (宗重), but more on this later. In short, Sōei has become the common reading for this smith, motstly to distinguish him from other Munehide smiths, like Chōgi (長義) is traditionally read Chōgi and not Nagayoshi, i.e. to set him apart from the other Nagayoshi smiths. Before we come back to the third generation Sōei, some background on his lineage. It all started in the late 1500s when Akamatsu Masahide (赤松政秀, 1510-1570) was castellan of Tatsuno Castle (龍野城) in Harima province and needed some swordsmiths. So he hired master Munenaga (宗長) from Wakasa province whose ancestor was once a student of the second generation Nakajima-Rai Kuninaga (中島来国長). It appears that Munenaga took several smiths with him, maybe his students, or that Akamatsu Masahide hired more Wakasa smiths as we see a certain migration of Mune… smiths from Wakasa to Harima at that time. Be that as it may, the Sōei lineage goes back to that relocated Mune… group. Fast forward to the early Edo period. The Akamatsu have been defeated and Harima province was split up into several fiefs after Sekigahara, with Himeji (姫路藩) being the most powerful one and being successively ruled by the Ikeda (池田), the Honda (本多), the Matsudaira (松平), and the Sakakibara (榊原). These relatively quickly changing rulers of Harima/Himeji might be a reason for why there are hardly any works of the first two generations Sōei extant, who are dated around Meireki (明暦, 1655-1658) and Kanbun (寛文, 1661-1673) respectively by the way. However, we know of worse situations and still plenty of swords being produced, so the issue of the circumstances of the first two Sōei generations needs further study. The earliest extant dated work of the third generation Sōei is from Enpō one (延宝, 1673). It is signed as being made in Harima province and we find dated blades made in Harima until Tenna two (天和, 1682). A little later, he came to the attention of Ikeda Tsunamasa (池田綱政, 1638-1746), the daimyō of the Bizen Okayama fief (岡山藩), who hired Sōei to work for him locally. We know two dated blades made with a reference to Okayama in the mei, one from Jōkyō two (貞享, 1685) and one from Jōkyo three (1686). Apart from that, we know of a blade that is signed “Suzuki Sōei saku” and “made with nanban-tetsu in Ōsaka” but it is undated and so we don’t know when he made that trip Ōsaka and how long he stayed there. Now the inscription does not explicitly say that this was the very day Sōei got that name change recommendation from Ikeda Tsunamasa but from experience I can say that such very detailed mei usually commemorate an important occasion. That is, it is in my opinion unlikely that the ancedote with the Samonji copy took place one or two years earlier and that “all of a sudden,” Sōei decided in 1694 that it is now time for a name change. In other words, I think the anecdote took place right before, most likely during the first month of that year and Sōei decided to wait for the auspicious day of the first day of the horse of the second month, a day which on which special prayers and shrine visits are taking place all over the country, to make this commemorative sword. Or at least it was finished and signed that day, forging obviously started earlier, so Sōei was working towards that auspicious date. Incidentally, it is unclear if the “forged with twenty folds” makes sense in metallurgical terms but it may not be interpreted literally, i.e. Sōei more or less stating here that the blade was forged with utmost care. As mentioned, we don’t know how long Sōei stayed in Bizen Okayama. The numerous works with a reference to Chigusa steel, e.g. one dated Genroku twelve (1699) don’t necessarily means that he was back home by then as Ikeda Tsunamasa could have arranged that the steel was brought from Harima to Okayama where Sōei processed it locally (via oroshigane). The earliest known dated blade that states it was made again in Harima is from Hōei one (宝永, 1704). The mei says “Ban’yō Tegarayama no fumoto ni oite” (於播陽手柄山麓), “made on the foot of Mt. Tegarayama in Harima province.” Now this blade is a special order blade, for a certain Yuguchi Sukeyori (湯口祐頼), and the syntax with ni oite (i.e. “at” and not “resident of”) differs from his earlier Harima-based mei where Sōei just signed with “Harima ni Kuni…” That is, he may have returned to Harima just on certain occasions and may have spent the rest of his life in Okayama? His successors however worked again in Himeji/Harima. According to tradition, Sōei died on the 27th day of the second month of Hōei five (宝永, 1708). Taking the mei of the blade introduced here as a basis, he lived to the age of 75 (and not to the age of 99 as stated so in the Kokon Kaji Bikō). The latest known blade that bears his age in the mei is from Hōei three (1706), stating that he made it at the age of 73, what is a match. There is a blade form his successor extant which is signed “Yondai-me Sōei jūsan-sai kore o tsukuru” (四代目宗栄十三歳造之), “made by the fourth generation Sōei at the age of 13”). As far as I know, this blade is not dated and we don’t know when the fourth generation Sōei was born. Tsuneishi says that the fifth and sixth generations died shortly after another, that is in Meiwa four (明和, 1767) and Meiwa eight (1771) respectively. The sixth generation is usually dated around Kyōwa (享和, 1801-1804) and all three, i.e. the fourth, fifth, and sixth masters, signed with “Harima no Kuni…” (播磨国…), “Banshū-jū…” (播州住…) or “Ban’yō Himeji-shin…” (播陽姫路臣…, “retainer of Himeji in Harima province”). So as mentioned, we know that they all worked again in Himeji/Harima. I hope this article gave you an interesting insight into the life of Sōei and I have a few more blades in my references that mark special occasions in the career of a swordsmith and which I would like to introduce in the future. If you are following me for a while, you may remember my article from a few years ago here about Muramasa signatures being altered after they have become “unpresentable” with the Tokugawa coming to power. Now in this brief article I would like to tell you that this was not only done to sword but also to tsuba signatures. Before I want to introduce a tsuba signature altered that way, I must begin with the history of the artist who made the piece in question, Myōju (明寿), and that is, the Umetada (埋忠) family. Now I want to keep it relatively simple here because on the one hand, the issue we are talking about is just about the name itself and not about anything the Umetada family “did wrong” or about someone having bad luck with Umetada works, and on the other hand, I want to write a book about Myōju with all the detailed info, just like my book on Kanō Natsuo. So as always, we have several traditions about the name origins of the Umetada family. One just says that the Umetada were descendants of the famous swordsmith Sanjō Munechika (三条宗近) and that the name goes back to lands in Kyōto located to the northeast of the Imperial Palace of the same name, Umetada (梅多田), which were granted to the family. Another one says that during the reign of Emperor Ichijō (一条天皇, 980-1011, r. 986-1011), the Kawarasaki Pond (Kawarasaki no Ike, 河原崎ノ池) was filling up with dirt but instead of cleaning it out, the emperor just gave orders to have the pond filled up completely. This task was gratuitously taken over by the very family which thereupon assumed the name Umetada (埋忠) which means literally “to fill up (umeru) (something) free of charge (tada).” Another theory also refers to a filling-up-a-pond tradition, although much later, in the early Muromachi period during the reign of Emperor Shōkō (称光天皇, 1401-1428). Many of you may know Nasu no Yoichi (那須与一, 1169-1190/1232), the famous Minamoto warrior who shot down the fan the Taira put atop a pole on one of their ships with a single shot during the Battle of Yashima in 1185. For this and other great military achievements, he received from Minamoto no Yoritomo (源頼朝, 1147-1199) a fabulous tachi by Ko-Bizen Naritaka (古備前成高). Now through very lucky circumstances, that very sword was handed down within the Nasu family for about 800 years, and is still extant today. Yes, you heard me correctly, 800 years in the possession of the same family! The tachi is depicted and described in the first volume of the Nasu Ke Gunki Zu (那須家軍器図), the arms and armors in the possession of the Nasu family, compiled by Yoichi’s descendant Nasu Sukeaki (那須資明) in Tenmei seven (天明, 1787). It is also featured in the Kansei twelve (寛政, 1800) publication Shūko Jisshū (集古十種) (see pictures below). Illustrations from the Shūko Jisshū. Fast forward about 150 years from Nasu Sukeaki, that is to December 18, 1935, the blade and its koshirae, which is contemporary to the blade, was designated to a jūyō-bijutsuhin. Then owner was Nasu Suketoyo (那須資豊), another descendant of Yoichi. The picture below shows the pictures from the jūyō-bijutsuhin designation. Forward another roughly 50 years, to June 6, 1987, the sword was elevated to jūyō-bunkazai status. Then owner, and you may already guess it, was another member of the Nasu family, Nasu Takashi (那須隆, 1924-2008). Today the sword is owned by the Nasu Yoichi Denshōkan in Ōtawara, Tochigi Prefecture. From the jūyō-bunkazai designation. Nagasa of the blade is 79.8 cm, overall length of the koshirae is 104.0 cm. Now let me describe this historically so important sword. Why it is so historically important? Well, it has a pretty rock-solid provenance, it dates back to the late Heian period, it is completely ubu, signed, has one mekugi-ana, and still has its original koshirae, so we are pretty much in supreme unicorn levels of Japanese swords. The tachi is slender and of a very elegant shape, as it is typical for that time, having a quite shallow sori along the blade section but which gets very pronounced in the tang and from where the tang starts. Incidentally, this peculiar blade/tang sori distribution is sometimes described as “he shape” as it resembles the hiragana syllable he (へ). And due to this curved (magari) hilt (tsuka), this sword got the nickname Tsukamagari-Naritaka (柄曲がり成高), lit. “curved hilt Naritaka.” The kitae is a rather standing-out itame to ko-itame that is mixed with mokume and that shows ji-nie. The steel is blackish and the hamon is hardened in ko-nie-deki and appears as suguha-chō with a rather tight nioiguchi along the top, and as a ko-midare-chō with a somewhat subdued nioiguchi along the bottom half. The bōshi is sugu with a ko-maru-kaeri. The koshirae features a hilt that is covered with black-lacquered same and wrapped with black-lacquered leather. Towards the cutting-edge side, a menuki like ornament in the form of a long and thin yamagane plate is inserted which shows engravings of a nine-coins crest and karakusa. The saya is covered with thin black-lacquered leather with an additional layer of greenish fabric whose pattern is no longer discernible. The fittings are of yamagane too and show the same ornamentation as the menuki. Unfortunately, the tsuba, fuchi, and kojiri are missing. In terms of prominent kabutogane, tapering and noticeable thinness of the saya, the mounting is typical for the late Heian period. So far, so awesome, 800 years old as mentioned, and I want to conclude by mentioning that there is the tradition that Minamoto no Yoritomo explicitly chose Ko-Bizen Naritaka for making the swords he was awarding to his closest retainers. Apart from the one introduced here, there are two more of these “Yoritomo-reward-Naritaka” extant. By the way, we know of less than ten signed works of Naritaka that are extant today, but let’s introduce the other two. One (see picture below) was given by Minamoto no Yoritomo to Kudō Suketoki (工藤祐時, 1185-1252) some years after his father Kudō Suketsune (工藤祐経, 1147-1193) was killed in the course of the Revenge of the Soga Brothers. Later, one of Suketsune’s descendants, Kudō Naritaka (工藤就堯), presented the sword to his new master, the Masuda (益田) family, who were the shugo-daimyō of Iwami province. The Masuda later became karō elders of the Chōshū fief and owned the sword until recent times. On June 6, 1980 it was designated as a jūyō-bunkazai and eventually bought by the state which put it into the custody of the Kyōto National Museum, This blade too is completely ubu, signed, has one mekugi-ana, a nagasa of 80.4 cm, and shows a kitae in itame and a ko-midare hamon that is mixed with ko-chōji. The other one was presented by Yoritomo to his general Sawara Yoshitsura (佐原義連) who was fighting for him in the northern Ōshū region, eventually receiving the lands of Aizu. Yoshitsura gave the sword later to his grandson Mitsumori (光盛) who changed his family name to Ashina (蘆名) and it was the Ashina who handed it down for the years to come. The blade (see picture below) has a nagasa of 82.4 cm, a sori of 2.7 cm, is completely ubu and signed in niji-mei too, and has two mekugi-ana. The jigane is an itame that tends to nagare and that features ji-nie and chikei. The hamon is a nie-laden chōji-midare with a rather subdued nioiguchi that is mixed with nijūba, many ashi and yō, and with kinsuji and sunagashi. The ha gets wider and more flamboyant along the monouchi. The bōshi is sugu and has a ko-maru-kaeri with a few hakikake on the omote side. This time I want to introduce a Natsuo tsuba which is not “just” a great masterwork like they all are but which is oustanding as it marks a very important stage in his career. The above shown tsuba has the motif of the God of Luck Jurōjin (寿老人) riding a crane on the omote and young pines on the ura side. It is of shakudō, has a nanako ground, and makes much use of empty space. Jurōjin on his crane is interpreted in a quite three-dimesional manner, jutting out in a relatively prominent from the ground plate. Jurōjin is regarded as auspicious, as is the crane, as are young pines. So just from the motif of motif elements alone we have triple auspiciousness so to speak. Highly elegant is also how Natsuo plugged the one hitsu-ana with gold as part of the design and has the nanako and parts of the motif running over it. That is, to emphasize the optical or rather perceived fact that Jurōjin is indeed flying on a crane, a reference point is required. Now you can just add for example treetops to create a sense for height, i.e. flying, but often the perception of flying high in the sky was achieved via the sun or the moon in the background. But instead of merely adding a flush hira-zōgan of the sun or lunar disc, Natsuo so to speak made use of the common practice of plugging hitsu-ana and turned that into the sun so to speak, what is in my opinion a highly elegant approach as stated above. So far, so good, very nice tsuba you will all agree on, but why is it sp special? Well, for this, we first have to take a look at the signsture, which reads: “Kōka san no toshi taisō shokyū – Ōtei-sōka Toshiaki + gold seal ” (弘化三暦大簇初九・鶯蹄窓下寿良), “humbly made by Toshiaki on the ninth day of the first lunar month, spring, of Kōka three (1846)”. First of all, the ninth day of the first lunar month is an auspicious day as it is the birthday of the Jade Emperor who is also revered in Buddhism, what adds quasi a fourth layer of auspiciousness to the tsuba (i.e. Jurōjin, a crane, and young pines being the other three). The more advanced kodōgu enthusiasts, and readers of my book(s) on Natsuo may know, Toshiaki (寿良) was the early name with which Natsuo signed. Now let me introduce his career up to the time this tsuba was made so that we get some background for its importance. Natsu was born on the 14th day of the fourth month of Bunsei eleven (文政, 1828). In Tenpō ten (天保, 1839), he started an apprenticeship with the kinkō artist Okumura Shōhachi (奥村庄八). Okumura was a Gotō-trained guy and so he learned from him first and foremost the proper application of nanako, the making of menuki, gilding and silvering via techniques like kingise, ginsise, iroe or okigane, and the production of ground plates for kozuka. Training under Okamoto was not enough because after just about one year of learning, it was in Tenpō eleven (1840), he left his workshop and entered an apprenticeship with Ikeda Takatoshi (池田孝寿) from the Ōtsuki school (大月). The Ōtsuki school was a renowned lineage of kinkō artists founded in the mid-18th century in Kyōto. The school followed initially the classical style of the Gotō school but then became famous when its fourth master Mitsuoki (光興, 1766-1834) started to study painting under contemporary masters like Ganku (岸駒, 1749/1756-1838) and Nagazawa Rosetsu (長沢蘆雪, 1754-1799) from the Maruyama school (円山). This means that later in his career Mitsuoki applied more and more novel motifs and tried fresh interpretations strongly inspired by his training as a painter. Takatoshi’s father Ikeda Kyūbei (池田久兵衛), who signed with Okitaka (興孝) and later with Takaoki (孝興), was a student of Mitsuoki but it is said that also Takatoshi studied directly with the fourth Ōtsuki master. Natsuo later said that under Takatoshi he spent two whole years, among other things of course, practicing katakiribori basics following copper plates designs given to him by his master. This practice helped him a lot and so his master decided it was time to grant him the character for Toshi from his own name whereupon Natsuo took the craftsman name Toshiaki (寿朗). He was 15 years old at the time. While practising kinkō he also studied classical Chinese in the morning under Tanimori Shigematsu (谷森重松), and in the evening painting under Nakajima Raishō (中島来章, 1796-1871) from the Maruyama-Shijō school (円山四条). His master Raishō even suggested that Natsuo should become a painter but he stayed with the kinkō art which mas more to his liking. Well, as Natsuo was born rather weak, his adoptive mother Miyo (みよ・美代) was initially against his wish to become a kinkō craftsman. Instead she made him learn to play the shamisen but Natsuo later told his students that he stopped that very early because it was absolutely not his thing. After five years of training under Takatoshi, the master realized the great progress his promising student had made and entrusted him for the first time with works for customers for which he could refine his takabori and kebori techniques, the first of them being menuki in the form of flying cranes, a fuchigashira set with a turtle motif, a kozuka with kebori of bamboo, and a tsuba showing young pines. And now we arrive at where the tsuba introduced here was made. In Kōka two (弘化, 1845), i.e. when he was 17 years old (or 18 according to the Japanese way of counting years), Natsuo decided that his craft was advanced enough to leave his master Takatoshi, and just one year later he took the risk to open up his own business in the old cultural capital Kyōto. In other words, the tsuba in question was made by Natsuo when he was just 18 years old (or 19 according to the Japanese way of counting years) and most likely the piece with which he celebrated his going into business for himself. It is now possible that he was comissioned with it by an affluent client, so to speak as form of support to get his business started, and we know that often clients left the motif of the work to the artist. That is, maybe Natsuo’s very first client told him he is going to pay him good money for a nice tsuba, as support for his craft, and that it just should depict something auspicious, maybe something with the upcoming New Year in mind. Or, Natsuo came up with everything for himself and thus placed so much auspiciousness into it, i.e. as a relatively safe bet to find a paying customer as auspicious motifs of course never go out of fashion. However, when he was twenty-five he had the feeling that Kyōto might not be the best place to unfold his talent as “so many people wore ceremonial court dresses and were just into fabrics and patterns.” So, he made plans to try his luck in Edo, the capital and the center of the bushi class. On the second day of the tenth month of Ansei one (安政, 1854) he borrowed 20 gold pieces from his adoptive mother and left Kyōto with his friend Chūshichi (忠七) and took with him a tsuba with the motif of the Oath of the Peach Garden into which he had put his entire heart and sold, to use as a demonstration piece to show his abilities in Edo. The rest of his career is described in detail in my book on Natsuo here. Above is a picture of the young Natsuo. I do not know how old Natsuo was at the time it was taken but I assume it is pretty close to when the tsuba introduced here was made. So in conclusion I want to say that this tsuba would surely make a very very nice cornerstone of every Natsuo collection. I do not know who the owner of the tsuba is but he must be very proud of owning this, in my opinion very special by and for Natsuo. This is going to be a very brief post. Background is, I was asked about a certain sayagaki which I explained to my client but which I thought might be interesting for some of my readers. Now as most of you know, a sayagaki is just something someone wrote on a plain shirasaya storage “mounting”, i.e. it can be anything from just barely mentioning what blade that storage mounting holds to an elaborate expert comment/praise of the blade in question. In other words, a sayagaki may add value, or at least additional info to the sword, but does not have to. As mentioned, most of you already know that. What I would like to explain a little bit in this post is the practice of adding an inventory number to a sword in shirasaya. Beginning with the Tokugawa family, every daimyō family had a more or less extensive sword collection that was usually stored away in some kind of kura (蔵・倉・庫), a special storehouse with thick earthenware walls that could withstand a fire for some time, usually located within the principal castle of each fief. In charge of managing that storage facility was the local koshimono-kata (腰物方), or koshimono-bugyō (腰物奉行) in case of the bakufu, i.e. a retainer who was responsible for keeping track of all the swords owned by the fief or the administration/lord of the fief in particular. So for example, when an important occasion was approaching, the daimyō called his koshimono-kata and told him to pick a proper gift sword for the wedding/inauguration/succession etc. person X. Note: The inscription on the hilt uses the old (拾) character for ten whereas the saya uses (十). So, there is obviously a number here, “1-70” but which is preceded by the character (仁), jin, which means “benevolence.” So, and that was the question from my client, what has that sword, number, or sayagaki to do with “benevolence”? Also, I have seen shirasaya inventory sayagaki that use the four directions of the compass – kita (北, north), minami (南, south) nishi (西, west), higashi (東, east) – which either refer to a certain section within a single kura storehouse or to a different storehouse within a fief. So, “lection” for today: If you have like jin or gi or rei on a period sayagaki, this does not mean that the sword is benevolent, righteous, or of proper rite respectively. No, these Five Confucian Virtues were merely used as a ranking system of 1 to 5. I have written about a kind of similar topic here. 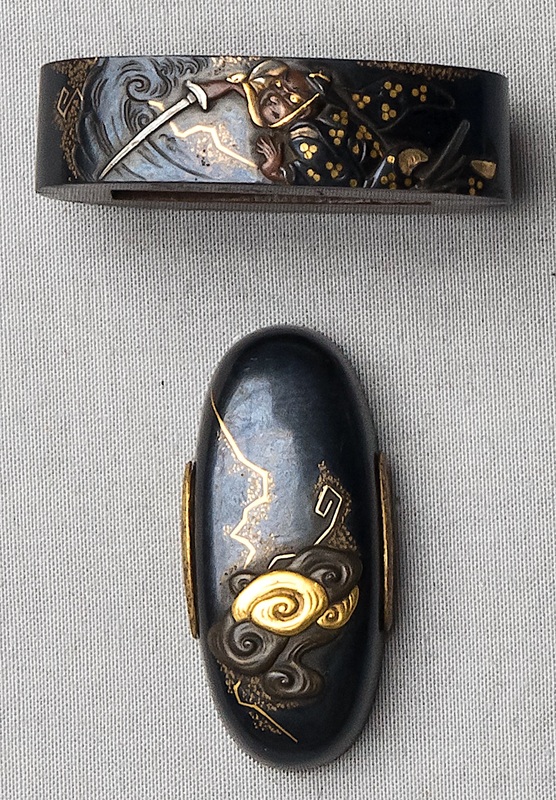 Whilst doing cataloging work for the Samurai Art Museum, Berlin, I came across a fuchigashira set by Gotō Ichijō (後藤一乗, 1791-1876) whose motif I had troubles with identifying. Now as you can see in picture 1 below, the set shows, embedded into thunder clouds and lightning, a fiercly looking guy wielding a sword, and although I am not yet 100% sure, I had the hunch that it might represents the story which I am going to share with you now. Or in other words, I might later find out that the fuchigashira set actually depicts something else, what is quite possible, but that hunch of mine about what it might show is a pretext for introducing that very story here. The year is Tenbun 17 (天文, 1548), a very hot fifth day of the sixth month, and the 35-years-old Tachibana Dōsetsu (立花道雪, 1513-1585) is taking a nap under large tree near his hown town of Fujikita (藤北) in Bungo province. (Note: That is according to the early Edo period Ōtomo Kōhai Ki (大友興廃記). The 20th century Yanagawa Shiga (柳川史話) says the incident took place on the fifth day of the sixth month of Tenbun six (1537) when Dōsetsu was 25 years old.) Suddenly, a storm came up and a big thunder woke up Dōsetsu, a thunder which was immediately followed by a lightning that struck the tree. But Dōsetsu swiftly jumped out from under that tree, drew his cherished sword Chidori (千鳥), “Plover” (named after its plover menuki), and cut the God of Thunder that came down on him in that lightning. So he survived but the lightning did struck him, although records vary on how much he got affected, that is, from “his legs constantly hurt throughout his life afterwards” over “his left leg was crippled” to “half (the left) of his body was paralyzed henceforth” is possible. Picture 2: Tachibana Dōsetsu (also named Bekki Akitsura, 戸次鑑連). Note how the face with the fierce eyes just looks like the depiction on the fuchigashira. Historic records mention that in his later years, retainers had to carry around Dōsetsu in a palanquin from which he gave orders wielding a long Bizen Katsumitsu (備前勝光) tachi with a nagasa of 82 cm in the one, and a teppō in the other hand, plus having a 3 ft long staff dangling from a cord attached to one of his hands which he used too to give orders. Now there is the tradition that Dōsetsu went like that, i.e. with the palanquin, into battle after the lightning hit him but when we look at other period records, we learn that he distinguished himself in consecutive battles (taking place in the years 1562, 1567, 1568, and 1569). None of these period records mention a palanquin and it is stated that in the 1567 Battle of Yasumimatsu (休松の戦い), he killed seven men with his sword and in the 1568 Battle of Tatarahama (多々良浜の戦い), he was riding right into the enemy lines from wherein he fought furiously. So, it is pretty unlikely that he did all that from a palanquin and it appears that he was doing pretty ok with what he suffered from that lightning stroke (it is said that throughout his life, he participated in 37 battles!) and that it only started to bother him in later years. In short, I think that people saw the old and then half-paralyzed Dōsetsu fiercely commanding his men from the palanquin and the legend was created that he had always been that way since he was struck by a lightning as a young man. So far Dōsetsu but what about the sword? It is still extant and preserved in the Tachibana Museum (立花家資料館) in Yanagawa, Fukuoka Prefecture. Well, this is the blade which was handed down as Raikirimaru because there is some discrepancy in measurements. The today extant blade has a nagasa of 1 shaku 9 sun 3 bu (58.5 cm), i.e. it was shortened at one point to become a compact uchigatana, or an ō-wakizashi if you will. The Tachibana family records however (Onkoshimono Yurai Oboe, 御腰物由来覚) mention the blade as measuring 1 shaku 6 sun 7.5 bu (50.7 cm) in nagasa. There is nothing wrong with period records not matching the present-day length of a sword as there is always the chance that it has been shortened since but this doesn’t work the other way around, that is, the blade can’t magically get longer and grow again 8 cm. A possibility is of course that the person who compiled the Onkoshimono Yurai Oboe just made a mistake and got the nagasa wrong. Back to Dōsetsu. When he died in Tenshō 13 (天正, 1587), the sword came into the possession of his adopted son and successor Tachibana Muneshige (立花宗茂, 1567-1643) who became the first Tachibana daimyō of the Yanagawa fief (柳川藩) of Chikugo province, the fief the family then ruled until the abolition of the feudal system. The ura side of the tang bears towards the nakago-jiri the kinzōgan-mei “Tachibana Hida no Kami shoji” (立花飛騨守所持), “owned by Tachibana Hida no Kami.” Hide no Kami was the honorary title of Muneshige but it is unclear if he himself had it added or if it was done later. Also unclear is if it was Dōsetsu who changed the nickname of the sword from Chidori to Raikirimaru or if one of his successors decided to better stick to that legend with the lightning and that the sword shall henceforth be referred to as Thunder Cutter. Even the Onkoshimono Yurai Oboe admits that is unclear from when on the nickname Raikiri was in use. As you can see, we are again facing one of these difficult cases where we have to work from one contradicting period source to the next and where we have little rock solid facts. Be that as it may, Muneshige bequathed the sword to his successor Tachibana Tadashige (立花忠茂, 1612-1675) who gave it to his sixth son Tachibana Shigetoki (立花茂辰, 1656-1678). Shigetoki died only three years after his father and at the young age of 23 and so it was decided to give the sword to Yashima Iwami Yukikazu (矢嶋石見行和) who was Shigetoki’s younger brother, but an illegitimate child of Tadashige. However, Yukiazu promised that the sword will be treasured within his lineage and the Yashima were anyway closely related to the Tachibana main line. So the sword was still quasi in family possession. Fast forward about one hundred years, the then head of the Yashima family, Yashima Suō (矢嶋周防), gave the Raikirimaru back to the Tachibana main line, that is, he presented it in Hōreki nine (宝暦, 1759) to the seventh Yanagawa daimyō Tachibana Akinao (立花鑑通, 1730-1798) on the occassion of Akinao was proceeding to Edo. By then, the Raikirimaru was appraised (by whomever) as Mihara (三原) work but as Akinao was going to Edo, plans were made to submit it to the Hon’ami family. For whatever reason, the blade was not submitted to the Hon’ami main line but to Kōho (本阿弥光葆, ?-1788) who was the 5th generation of the Hon’ami Kōtatsu lineage and who appraised it as a Sōshū work. As a return gift, Yashima Suō was given a chiisagatana by master shintō smith Yamato no Kami Yasusada (大和守安定). Picture 4: Color photo of the Raikirimaru. To wrap things up, I want to briefly address the workmanship of the blade. As you can see in picture 3 and 4, it features quite a deep sori and ends in a chū-kissaki, what suggests that it was once of a pretty magnificent tachi-sugata, probably end of Kamakura. The jigane is a ko-itame that is mixed with nagare and the hamon is a nie-laden suguha with a wide nioiguchi but the jiba is overall relatively calm and does not feature much prominent hataraki like chikei and kinsuji. So, although this is just a remote diagnosis without ever seeing the sword, I can both understand the Mihara and the Sōshū approach, the latter more like referring to early Sōshū like Shintōgo Kunimitsu (新藤五国光) or Yukimitsu (行光). The nakago is ō-suriage as mentioned, has katte-sagari yasurime, three mekugi-ana, and of the kinzōgan-mei, the gold has come off of the last three characters. So, when I have the chance to travel to Fukuoka, I surely want to visit the Tachibana Museum and I then want to inquite beforehead if it is possible to see the Raikirimaru (not sure if it is on permanent display but hands-on study would be perfect of course).